Hayes’ Grace Miller (11) and Buckeye Valley’s Kennedy Wirth battle for possession during the first half of Thursday’s non-league showdown in Delaware. The Delaware Hayes girls soccer team got two goals in the first nine minutes and held off rival Buckeye Valley the rest of the way for a 2-1 non-league victory Thursday night at Cornell Stadium. Sydney McMillin took a Maddie Smith centering feed to give the Pacers a 1-0 lead with 36:27 left in the first half. Grace Miller broke free and scored with 30:58 left in the opening frame to give Hayes a 2-0 cushion. Weller made a diving stop on a Daelynn Rosser header off a Megan Hon corner kick. The ball almost trickled all the way across the goal line, but Weller stopped it in time. It was a good thing too because Hannah Cowan scored on a Kennedy Wirth centering pass that just trickled through with 0:03 left in the game to get the Barons on the board. Rosser accounted for BV’s two best scoring chances of the first half as well. She sent one off the crossbar in the 21st minute. She also forced Weller to leap high and right to stop a shot from going in in the 33rd minute. Weller finished with nine saves for the Pacers (6-5-2). The win is Hayes’ fifth in the last seven games after a winless stretch of five games (0-4-1) earlier in the season. The Pacers have outscored opponents 15-5 over that stretch, going 5-1-1. It also marks the fourth straight victory over their rivals from BV. The Barons last won in 2013. Cami Crawford stopped 12 shots in goal for the Barons (9-4), which had won their previous two games by a combined 18-0 margin against MOAC-foes Marion Harding and Marion Pleasant. BV has been without one of its top players, Jillian Hon, who suffered a MCL injury in the win over Harding Sept. 25. She played for a couple of minutes early in the second half, but couldn’t go any longer. “With rehab, they’re expecting to have her back by tournament time,” Schmitt said. Next up, both teams are back at it Tuesday night at 7:15 p.m. Hayes returns to OCC-Cardinal competition at home against Dublin Jerome and BV visits Worthington Kilbourne in non-league action. 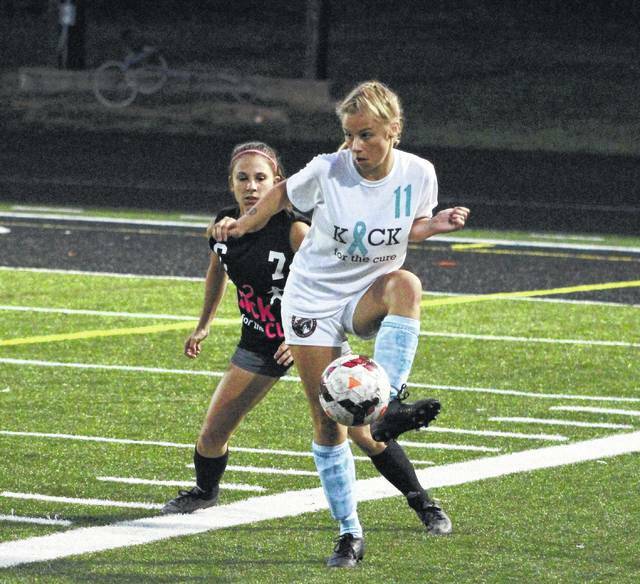 https://www.delgazette.com/wp-content/uploads/sites/40/2017/09/web1_kick.jpgHayes’ Grace Miller (11) and Buckeye Valley’s Kennedy Wirth battle for possession during the first half of Thursday’s non-league showdown in Delaware.